Oldcastle APG company Jewell has opened a 23,000-sq.-ft. dry mix concrete and mortar packaging plant on a 15-acre Burnet, Texas, site, complete with quarry. Known as Marble Falls, it joins sister Lone Star State operations in Hurst, Katy, Rosenberg and Waco, plus seven distribution facilities near Austin, Dallas/Ft. Worth and Houston. Through 30-plus years, Texas-based Superior Concrete Products has pushed the delivery boundaries of value-added precast fence and wall offerings in contracts with owners who will incur transportation premiums when a good turnkey solution for a home, building, ranch or other property perimeter is on the table. It has built a production team especially adept at crafting urethane formliners with wood, stone or other natural textures; fabricating forms for efficient handling and staging; and, formulating integrally colored mixes to yield unique ranch-style fences and architectural or utilitarian site, sound or security walls. 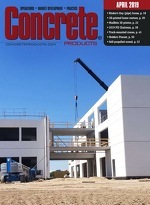 For Superior Concrete and peers, the latter category has proved to be among the fastest growing in precast concrete.